We hired Decks 'N Stuff to build a cedar deck to overlook our new pool and we couldn't be happier. From my initial telephone conversation with Tim I knew things were going to go well. Tim was informative, responsive and easy to get along with. 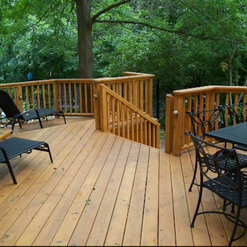 He made time to come out to our property right away and provided me with a very reasonable quote for the removal of our existing deck and the construction of a new deck. We changed our minds on the design a few times throughout the process and Tim was very flexible in working with us. He came out to the property each time to talk through the changes with me so that I could make the right decision. He worked very well with our pool crew and worked around the pool schedule. Tim also went above and beyond anything I could have expected when he made the time to go and pick up the glass for my railing which I ordered privately and was unable to have delivered or pick up myself. Overall a great experience working with Tim and his team and our deck looks fantastic. When we go to do the fence in the next year or two we will definitely be calling Decks 'N Stuff again. When you are hiring a contractor for any project, your perform your due diligence, trust you have all the information to make an informed decision and hope everything runs smoothly. Working with Tim was a pleasure. I had contacted Decks n Stuff by email in July with a rough design of what we wanted and asked for a quote and time line. Tim and I then had a call so he could get a feel for our budget, expectations, timing and budget so both of us were on the same page. Tim came over to assess the site and we sealed the deal with a hand shake. Contract signed and deposit provided shortly thereafter. The work started in August and was completed on time and on budget. Tim and I would have informal meetings each morning him and his crew was on site to go over any question either of us had and Tim would give an update on what would be done that day. I was always kept informed of their schedule and there were no surprises. Everything was done to our liking and we are really enjoying our new deck. Our neighbours have also commented to us how good a job they did based on watching the construction and seeing the final product. Would definitely recommend and I have. We hired Decks 'N Stuff to build a deck and pergola as well as a kids' sandbox. We are thrilled with the results and can highly recommend them. Tim Harney was excellent to deal with from start to finish and we have a beautiful, well-built deck that gets many compliments. We were so pleased, we had them back a second time to install pavers, and would definitely call them again for any future work. It was a pleasure to deal with Tim and his team and we highly recommend them for any project, large or small.